Diecast models come in various scales and/or gauges. If you are not sure what scale or gauge is right for you, please continue reading for more detailed information about scales, gauges, and most popular models. The scale size of a model is a fraction of the real size. A 1:18 scale model is 1/18th the size of the real vehicle. 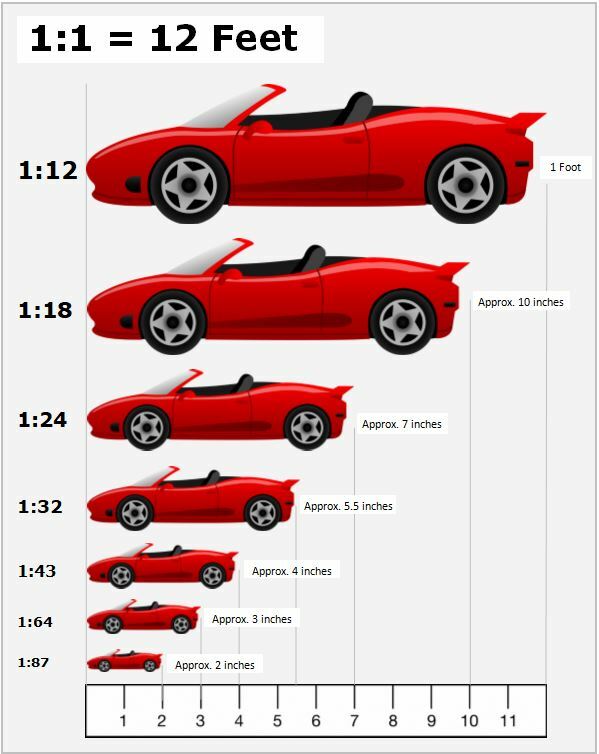 The smaller the number in the scale size, the larger the model. In the world of models, gauge may be used instead of scale. Particularly if a vehicle is meant to be used with a train set. Scale can also be referred to as "gauge". If you're searching for a particular model in 1:24 or 1:25 scale and can't locate it, search for it using G gauge. A G gauge item is usually considered to be 24th or 25th scale model. 1:12 scale - Very large, highly detailed models; usually about 14 or 15 in (36 or 38 cm) long; mainly targeted at adult collectors. These models are generally much more expensive than the 1:18 models. Many diecast motorcycles are also produced in this scale. 1:18 scale - Large, detailed models, usually about 8 to 11 in (18 or 20 cm) long; mostly targeted at adults. America is the main market for these, although some European and Australian companies also produce cars and even trucks in this scale. 1:24 scale - This has long been a favored scale in the USA, due to many construction kits and dealer promotional models being this size. Mebetoys of Italy had a large range of cheap 1:24 toy cars. Franklin Mint and Trax also use this scale. 1:32 scale - Intermediate size, most common for model tractors and other agricultural vehicles. Britains has used this scale for decades, and it is also used by Ertl and Siku. Vintage car models are also quite common in 1:32 scale. 1:36 scale - Popularized by Corgi in the 1970s, a common scale for toy vehicles such as those from Maisto, Kinsmart and Welly. 1:34 scale - Used almost exclusively by First Gear Models of the USA for their large scale diecast trucks. 1:43 scale - The most popular scale for model cars worldwide. This scale was made popular by Dinky in the 1930s as it was compatible with O gauge model railways. This scale is the most commonly used in Britain, Europe, Japan & Australia, but less so in the USA. In continental Europe 1:43 is often favored for model trucks. It is also widely used for hand-built models in resin and white metal. 1:48 scale - Several companies produce diecast model aircraft in 1:48 scale, which is a popular scale for plastic construction kits. Some diecast military vehicles and model train accessories are also made in this scale. 1:50 scale - The most widely used scale for trucks, buses and especially construction vehicles. 1:55 scale - Used mostly by Siku of Germany for its toy range of cars and trucks. The Disney-Pixar Cars Die-Cast Line by Mattel are usually in this scale. 1:60 scale - The scale of the immensely popular pre- and post-war military vehicles series by Dinky Toys (including military Dinky Supertoys). It is still used by many military modelers. 1:64 scale - Popular for farm models and American model trucks. Matchbox, Hot Wheels, Johnny Lightning and model Nascar racers are usually this size. 1:72 scale - Usually used for military die-cast armored fighting vehicles due to compatibility with 1:72 plastic construction kits. 1:76 scale - Scale popular mainly in Britain, Australia and Hong Kong for highly detailed buses and lorries such as those by EFE and Corgi OOC, and Trax Models in Australia. These models were originally intended as OO scale model railway accessories; however, became collectibles in their own right. 1:87 scale - These are compatible with H0 scale model trains and tend to be more popular in the USA and continental Europe. They are more commonly made of plastic and German companies such as Herpa and Wiking, produce wide ranges of highly-detailed models in this scale. 1:148 scale - Compatible with British N scale model trains, this scale has recently gained popularity in the UK due to its compact size and low priced models from Oxford Diecast. 1:400 scale - A common scale for aircraft, as a car in this scale would be fairly tiny. Meccano (Dinky Toys) aircraft were made at scales ranging from 1/122 to 1/265 and their ships from 1/1200 to 1/1985.